The devil’s ultimate goal is to see you in hell with him. All he does is look for ways to draw you into sin. As with any battle, it is important to understand your opponent and their tactics–since you are in a constant spiritual battle for your eternal life it is of utter importance that you understand how Satan operates. 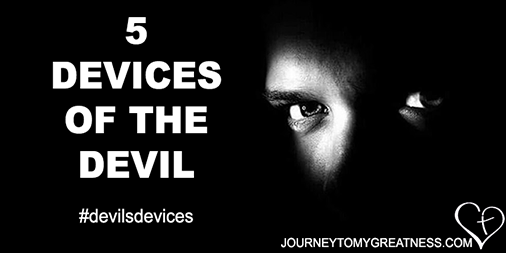 The 5 Devices of the Devil will help you recognize the enemy and understand the tactics he uses. In Revelation 20, Satan is called the deceiver, meaning he will lie, trick, and mislead you into wrong. He will do anything in his power to blind your mind and bind your heart. As a part of his deception, he will disguise himself as a godly person (2 Corinthians 11:13-15) to lead you away from fundamental truths. He will twist the Word of God to further his deception as he tried to do in his response to Jesus–quoting Psalm 91 incorrectly in his attempt to tempt Jesus. He’ll try to confuse and conceal your sin, having you believe the lies you tell yourself to justify your wrong. In Satan’s quest to pull you to his side, he will divert your focus away from God. Have you seen this happen, a young person decides to give their life to Jesus, they’re coming to church and bible study regularly, but before you know it they stop coming to church because they found a job that requires them to work Sundays? Satan wants our minds on lesser unsustainable things of the world and not on the greater things waiting for us in heaven. How he does it: If you look at Matthew 4, you’ll see that the tempter didn’t come right away. He waited until Jesus was so weak from fasting and being in the wilderness. He thought Jesus’ weakness was the perfect opportunity to divert His attention away from the Father. Satan will wait until you are in your own personal wilderness and use it as a distraction. It’s when your children are acting up, or your finances aren’t right, or you’re having problems on your job, that’s Satan will come in and try to pull your focus from Jesus. Satan knows who Jesus is, yet he still tried to use the old “prove it,” trick. Losing confidence in who you know you in Christ is a diversion tactic the devil uses to poison your aspirations thus making you believe you aren’t good enough or worthy enough for all God has promised you. How he does it: God works outside the realm of time, thus doing things in His own timing. Satan uses discouragement to tempt us to be impatient to God’s timing, provoking you to go your own way, doing things your own way. If in you eyes God is taking too long to answer a prayer or do something He said he would do, Satan will try to make you feel like God won’t do it. No matter how long you’ve been running this Christian race, there’s always room for improvement. There will be spiritual setbacks and obstacle to overcome–you can always do a better job, but Satan will have you thinking that you haven’t done enough or worse, making you think what you’ve done wasn’t good enough. Ultimately, discouragement is a diversion tactic to get you to give up on God. Yet God didn’t promise you an easy walk, through fields of roses and butterflies. Life is hard. Hardships and heartbreak will happen, this is a part of life. But Satan doesn’t want you to see it this way–which is ironic because he is all about chaos and confusion–he will distort God’s mercy and loving kindness, leading you away from what God has promised you. Satan primary goal is to separate you from God. Sin separates us from God (Isaiah 59:2), plain and simple; because of God holy nature, He can’t stand sin; because our sinful nature, we can’t seem to stay away from sin. It’s only the power of Jesus that can remove the blinders put on by sin. Think about all you experience in a typical day: somethings are edifying to the spirit, while others are destructive to the spirit if we indulge in them. How he does it: Satan, first works to divide you from God’s, tapping to your anger, fear, pride, greed. You’ll struggle within yourself, always trying to do that which is right, but feeling torn because evil is always at hand, as Paul described in Romans 7. Satan will try to bring disorder to the unity Jesus established on the cross with you and God the Father. Satan will have your thoughts ruminating on past hurts, resentment, misunderstanding, and arrogance to drive a wedge between you, other Christians, the church, and God. Satan thinks he is on God’s level and should be worshiped as God. In the third temptation in Matthew, Satan showed his true colors. Of course, Jesus cannot sin but ponder for a few if Jesus actually got on his knees and worshiped Satan. What destruction that would have brought into the world! Satan wants to be God; he wants the glory that belongs to God alone. He won’t reveal his true nature to you until it’s too late if he does at all. He’ll portray godly attributes, in his attempt to imitate God. How he does it: Satan is the prince of this world, therefore he’s all about the things of the world. There for any and everything you desire above God, Satan has a hand in. He will pull your attention away from godly things and onto things his domain. Satan doesn’t make anyone sin. Repeat Satan DOES NOT make anyone sin, so please stop lying to yourself with the “devil made me do it” excuse for your sinful behavior. That said, he does plant the seeds of deception, diversion, discouragement, and division in us, ultimately leading us to destruction if we don’t come to terms with our wrongdoing and repent humbly before the throne. Satan perverts God’s Word, his blessings, and benefits given to you as a believer. Don’t be lead astray by his tactics. His desire is to blind and bind you in sin. Recognize his attacks, especially when you are going through in your personal life; he is always lurking in the shadows waiting to hunt you down at the first sign of weakness.